Natural methane leakage from the sea floor is far more widespread off the U.S. East Coast than previously thought, according to a study published in Nature Geoscience this week. Researchers from Mississippi State University, the U.S. Geological Survey, and other institutions discovered least 570 natural methane seeps in a 94,000 square kilometer area between September 2011 and August 2013. And while it is believed that the seeps have been there for at least 1,000 years, the report’s authors are concerned that rising sea temperatures could cause them to emit the greenhouse gas at increasingly rapid rates. While researchers have not yet collected samples of the bubbles, co-author Carolyn Ruppel says they are presumed to contain methane because of their sources. The seeps at shallower depths are likely to come from now-submerged areas that were methane-producing wetlands during the most recent ice age. However, of greater concern are the deeper seeps along the continental slope, which lie at cold depths in which ice-like gas hydrate has formed at high pressures within sea-floor sediments. Gas hydrate contains trapped methane produced by microbes and may now be slowly breaking down because of the warming of overlying waters, says Skarke. 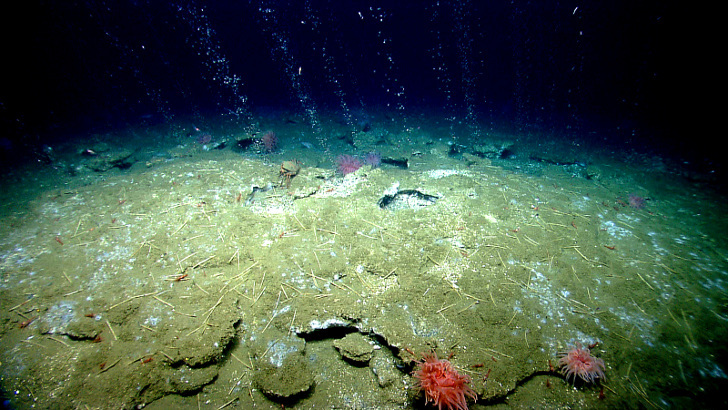 An increase in ocean temperatures would therefore cause the more rapid release of methane from these seeps. The discovery paves the way for further research. Not only does the composition of the seeps need to be verified, but the U.S. Geological Survey notes that the near-shore seeps that could potentially leak methane directly into the atmosphere need to be identified and studied further. Also, obviously, the rate of release needs to be assessed so fluctuations can be monitored. The discovery was also most unexpected. As Skarke notes: “Widespread seepage had not been expected on the Atlantic margin. It is not near a plate tectonic boundary like the U.S. Pacific coast, nor associated with a petroleum basin like the northern Gulf of Mexico.” Further mapping will therefore reveal if ocean methane release is far more widespread than previously believed. Researchers from Mississippi State University, the U.S. Geological Survey, and other institutions discovered least 570 natural methane seeps in a 94,000 square kilometer area between September 2011 and August 2013. 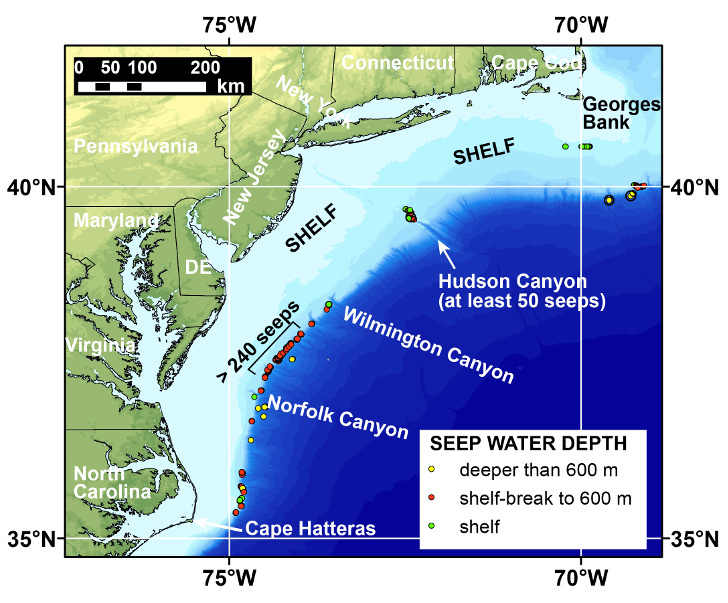 The area studied ranged from Cape Hatteras in North Carolina to Georges Bank off Cape Cod. And while it is believed that the seeps have been there for at least 1,000 years, the report’s authors are concerned that rising sea temperatures could cause them to emit the greenhouse gas at increasingly rapid rates. Using sonar, scientists noted bubble plumes of methane rising from the ocean floor. Previously only three such plumes had been discovered off the East Coast continental shelf, although they are relatively common on the West Coast and in the Gulf of Mexico. 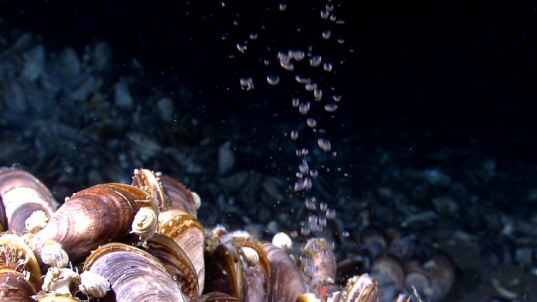 The seeps were discovered at depths of between 50 and 1,700 meters, but although some of the plumes extend hundreds of meters above the ocean floor, the bubbles of methane typically oxidize into carbon dioxide and dissolve into the sea long before they reach the surface. Natural methane leakage from the sea floor is far more widespread off the U.S. East Coast than previously thought, according to a study published in Nature Geoscience this week.